Importance of Fineness of Cement. Fineness test of cement is done to determine the particle size of cement. As, the rule of thumb, the finer the cement particle the best will be the cement and on the other hand the coarser the particle it will not be that good. 2. Air Permeability Method (Blaine Method). However, in this article, we’ll only discuss about the sieving method of determining the Fineness of Cement. Because this is the most common and easiest method to test fineness of cement. As per Indian Standard, the cement particle more than 10% shall not retain on the sieve (90 µm). 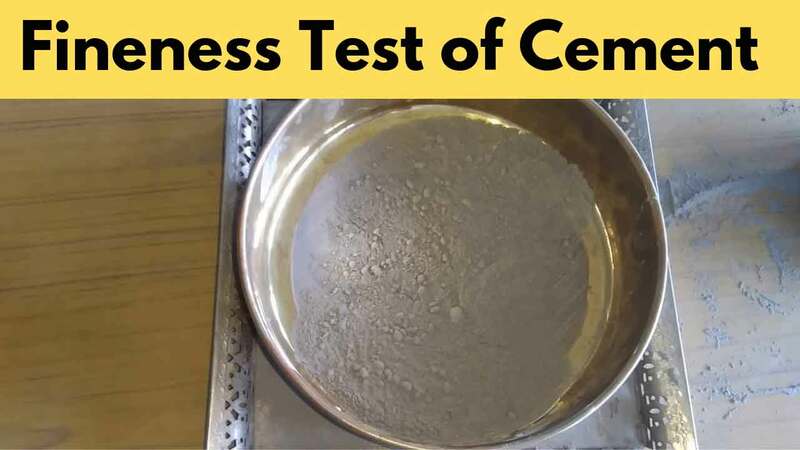 In this article, We are going to discuss about the Fineness Test of Cement; its importance, apparatus, procedure, result in details. 1. It can decrease bleeding. 2. It can increase the final strength of cement. 3. Fineness can also affect workability. 4. Fineness test indirectly measures the surface area of the particles of cement per unit mass. 5. Fineness increases the strength development in the cement principally during its first seven days. 6. It increases the rate of hydration. More is the fineness of cement particles more will be the rate of hydration. 1. IS Sieve (90 µm) with lid. 2. A balance of 0.01 gm sensitivity. 3. A pure bristle or nylon brush. 4. Sieve Shaking Machine (optional). 1. Take 1000 grams (1 Kg) of cement for the test sample and name it as (w1). 2. Rub the cement particle well with your hands so that no lumps are left. 3. Now pour the 1 Kg cement content in the sieve and close it perfectly with the sieve lid. 4. If you have a sieve shaking machine then it’s awesome, now you just need to put the sieve in the shaking machine and start the machine for 15 minutes. Anyway, if you don’t have the sieve shaking machine then no problem, you can shake it also with your hands. But you need to make sure that the sieving operation is done in all the direction for a minimum of 15 minutes. 5. Brush the sieve base gently with the bristle brush so that nothing is left on the sieve surface. 6. Now just weight the retained amount of cement on the sieve and note it as (w2). 7. Now you need to find the percentage of the weight of cement-retained on the 90 µm sieve. Percent of cement retained on sieve = (w2/w1) x 100. 9. Repeat the test for at least three times to minimize the risk of errors. According to Indian Standard, the amount of cement-retained on the 90 µm sieve shall never exceed 10%. If you have taken an amount of 1000 grams of cement (w1). And after testing, you found the retained weight of cement on the sieve, Let it be 65 grams (w2). % of retained weight of cement = (65/1000) x 100. SO, the result of a fineness test of cement will be 6.5 % which is below the IS value (10%) and hence cement is in good condition.